I have a few people ask if they can use their Fire Pit on their deck. If your deck is made from wood or a composite material it is not wise to use a fire pit or chimenea. The DeckProtect will change that, it is made for just this reason. We will look at how it is made and how it protects your investment better than anything else on the market. With the heat of the Fire Pit hitting 1000 to 1200 degrees, you will need some kind of protection for a surface that will burn or melt. Most composite decks will melt and your fire pit will be tossed out without some kind of protection. If you get one of the deck pads it will not protect your deck surface from the intense heat. In comes the Deckprotect. 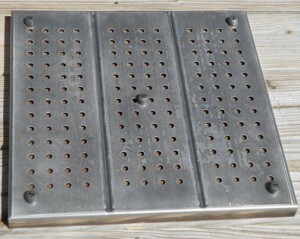 The Deckprotect product is made from 16 gauge Aluminum frame, drilled with over 100 holes for drainage. The frame has five 1/2 inch tall rubber legs to keep the frame off of the deck, so that it does not leave any mildew or stains on your deck boards. This will also allow air to flow between the deck and the frame for better cooling of the deck. The important part is the pad that is in the frame. This pad is made from volcanic rock that is crushed and then melted. When soft it is pulled into fibers and then woven into the pads used in layers in the aluminum frame. This product is completely fireproof, will not rust or rot. It is tested to withstand temperatures to 1400 degrees. This product is manufactured in the United States and comes with a one year warranty against manufacturer defects or flaws. If you have a Trex deck with one of the lowest temperature melt rates, the manufacturer recommends the DeckProtect product to protect their decking material from damage from a fire pit. When measuring your pad, make sure that the fire pit fit/chimenea legs sit on top of the pad if you have a deck made of a composite material. Depending on what kind of surface that you are putting your fire pit or chimenea on will dictate the size of the pad. For a wooden deck it is OK to have the legs of the fire pit on the outside of the pad. For a composite deck it is recommended to have the legs on the pad. Take measurements of the legs and then you can determine the size of the pad that you will need. The pad will come in five square sizes, 12 inches,16 inches, 24 inches, 27 inches and 36 inches. All pads will be the same thickness. 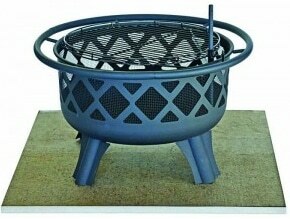 Sitting the legs of your fire pit on the pad will not damage the fire proof material. Since this video has been produced that pillow has been replaced with a mat. If you want to protect your wooden deck, composite deck, grass or concrete pad, this DeckProtect will do the job. 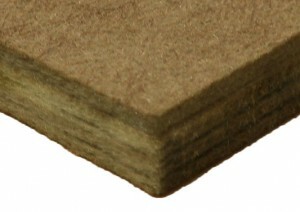 One manufacture has stated that this is the product to use if you are going to use a fire pit on their decking material. The big complaint from owners of these pads is that if you have stray embers, you will have to address immediately. The pads are not big enough to cover a large area. If you have an ember cover for your pit, you should use it to control stray embers. I hope that you have a better idea of how it is made and how it works. This DeckProtect product used properly will last the lifetime of your fire pit. If you found this information helpful, share on your social networks to let your friends know. Thanks for reading my post, if you have any questions, comments or need more information on anything, use the forms below and I will get back to you. did not even know there was such a product to purchase great idea for those of us who like fire pits I have one and it is on a brick platform. like the way you explain every aspect of the item. Had many questions on using a fire pit on a surface that will burn or melt. These pads seem to be the real deal, the big drawback is the ability to cover a large area. Maybe have a hearth rug around under the pad that covers a large area and the fire pad under the fire pit. l do use open fires but was not sure if l have to cover it or not till a friend said i have to. Was looking for places to find the right size when i got to your site. You have explained things so well that anyone can understand and follow. Thanks to you my fire pit will be dry and ready to use this winter without having to shovel out water. You did not mention the price,i`d like to know how much before l order. thanks once again for a very informative post. follow the links on the post for pricing, as pricing changes quickly, I try not to post any. Current pricing starts around $87 for the small one to around $270 for the largest one. This is still a good investment considering the cost or replacing the surface of a deck. This is great information, thanks for posting! I was wondering if you can use this product under a charcoal grill? I have camping grill that uses charcoal and I’m afraid to use it on grass because it’s very low to the ground. Would this product help at all? Also, would DeckProtect be suitable for a balcony? I’d like to use the grill I have on my balcony but I don’t know if it’s safe. The DeckProtect would be good under any grill or fire pit. You would have to get the largest one for the best protection for a grill. No matter what material the balcony is made from this pad will protect from all heat damage, it is also used on concrete. I was just googling on how to fireproofing my deck when I came across your article.Thanks for the advice on which product to chose. People should really pay attention an protect their deck when they have hot fire pits. I have seen so many people skipping this and I sometimes feels its a miracle that their entire deck hasn’t gone up in flames. Had a neighbor put ashes from the fireplace on a deck in a container. The ashes made the deck catch on fire and burnt the house down, it does happen. The DeckProtect will keep you safe when burning on a deck. That was really interesting for me and found it really useful. There was a nice idea behind that product. Thank you so much for the post everything explained completely and in a very simple way, just one thing that i wanna ask is about the weight? you told that all of them have the same thickness but nothing about the weight as I wanna know if they are portable or not?but I think they should be so heavy. They are very portable, even the biggest on will weigh less than 10 pounds . The aluminum frame and cloth like middle will not weigh very much. you can take them when you tailgate or camp. I never realized this was even necessary but can definitely see why it would be. We use fire pits often but typically on concrete away from the deck but will be using a pad if we ever decide to move to our deck. I can totally relate to the embers as being an issue as that has happened to me before. They can get pretty wild and a cover is a must. Thank you for sharing your insights. Very helpful. I look forward to visiting your site in the future for more useful tips. 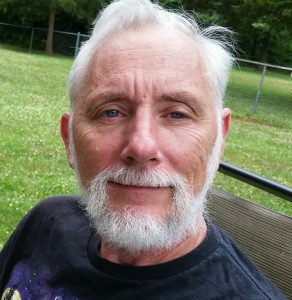 I had a neighbor burn there house down with a bucket of ashes left on a deck. It is very surprising how hot the ashes and fire can be in a short time and how long it will stay hot. Without the DeckProtect system you could burn down your house, they are well worth the money. They protect more than the traditional mat that most people use. Well this certainly addresses a thought I had about placing a fire pit on a wooden deck. At present my fire place is on a stoned in patio area with broken slabs of granite. I was thinking of possibly doing a fire pit in another area of my yard on a deck. Your post has the perfect answer to the questions I was thinking about for proper safety. Once again you have the answers to what I need for my outdoor space, thanks again. Moving the fire pit is easy, finding a safe place to use it is not. Fire safety should be on every one’s mind when burning wood around the house. A friend of mine melted the siding on his house when he sit the BBQ pit too close. Having your fire pit on a stone patio is a great place to keep the embers from letting the fire spread. Excellent overview and detailed explanations John. The technical info is kind of fascinating to me since I’ve been dealing with home improvement for over a decade (in another area, not outdoor stuff). Melting volcanic rock and weaving it into the pads with an aluminium frame sounds like it will definitely get the job done! I work a lot with ceramics and porcelains and they’re also used in high temp applications – I wonder how they would hold up if they were to be used as well? Once again, excellent detailed description and it should definitely educate anyone wanting to know why this particular product will withstand the heat and protect their decks. One of the houses on the way to town burnt to the ground because of catching the deck on fire. This will be great for those who love to burn outside, just do not want to wander into the woods. This is so cool! I live in a very dry place, so things can catch on fire pretty easily, and this sounds so useful. Is the volcanic rock pad removable/replaceable? And is the aluminum thick enough to not get bent out of shape too easily? My only concern would be that it could eventually become uneven and risk becoming an unstable surface if it were damaged. Other than this, it sounds fantastic! The pads are not available as a replacement part at this time. If you do not store this outside in the weather it will last a long time. The aluminum is thick enough to withstand normal wear and tear. If you drop it or run over it with the mower it will bend. It does have feet to level on a flat surface, if a little out of level it would not be hard to bend back into shape. We actually have one of these at our house and it really is awesome. its such a cool feeling to be able to sit out on the deck and enjoy a fire where before we would have to walk around to the back edge of the yard near the woods where we had an old burn pit and fight mosquitos while we tried to get it to light. Not to mention the fact that we always had to have the hose ready just in case the fire spread. Great post! These Fire Pit Deck Protectors are really worth the money. You can use your pit almost anywhere without the fear of a fire or melting the composite decking. I was wondering if you think some sort of deck protection is necessary on a wooden deck with a propane fire table? If the table does not have some kind of heat block on the bottom, you will need to protect your wooden deck from damage. The heat from the bottom of the table will discolor the wood.